The brick poultry house was constructed in 1878. Its sturdy construction is a testament to the importance of poultry among the Shakers’ agricultural endeavors. 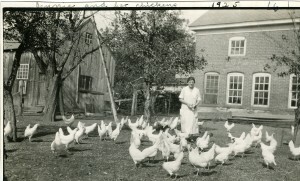 The livestock and poultry raised by the Shakers went primarily to their own use, though the Hancock Shakers did sell eggs locally and supplied white leghorn chickens and eggs to the hospital in Pittsfield. This structure serves as a fine example of the Shakers’ use of passive solar gain in their architecture. The large number of south-facing windows helps to warm the building naturally. The additional light helped to combat what would typically be slow egg production during winter months. Apple trees were planted strategically along the southern side of the building, providing shade during the hottest months and letting sunlight through their bare branches in winter. Early in the museum’s operation, the building was renovated to house a museum store, gallery areas and Village offices. 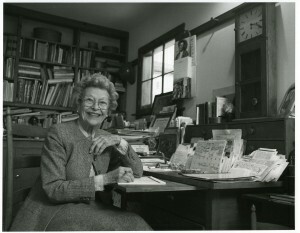 The museum’s collection of gift drawings was first exhibited in this space, and the museum’s founder, Amy Bess Miller, had her office on the second floor. Prior to the construction of the Center for Shaker Studies in 2000, the museum’s library was also housed in the upper floor. Since 2010, exhibitions of contemporary art have inhabited the first floor, with proceeds from sales helping to support the Village’s programming.